The Singles Ministry at Sun Lakes United Methodist Church is a very active one. Its purpose is to provide friendship and activities for single members of the church (including those who may not be single, but are living alone). Each month, from October to May, the Singles Committee plans two activities. We carpool to events from the church east parking lot and will arrange transportation when requested. 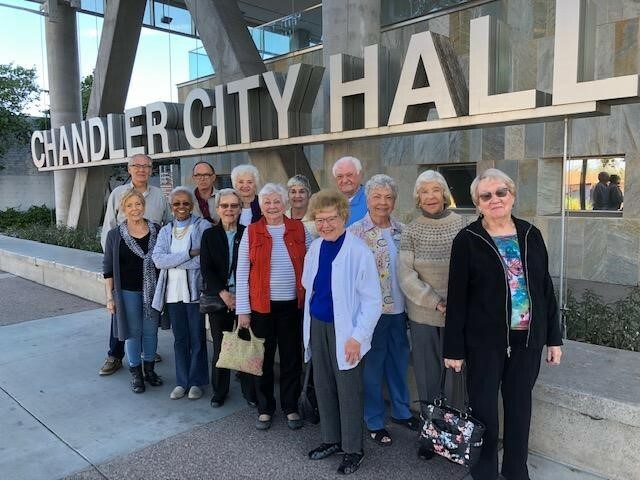 The first Tuesday of each month, the group enjoys “Movie Tuesday,” attending a current movie at a local theater, usually followed by dinner and discussion. Other activities range from potlucks to concerts, museums to musicals. It’s always something new! October – Welcome Back Potluck; November – Shamrock Dairy Tour; December – Hale Theater production of “A Christmas Carol;” January – Chandler Symphony Orchestra; February – Salt River Brass; March – Basha Museum of Southwestern Art Tour; April – Mesa Rose Garden Tour; May – Pizza and Movie Night in Lindsay Hall. Activities usually include lunch or dinner. We would love to have you join us – just check out the upcoming events in our Church Bulletin or on our Church Calendar and get signed up in Lindsay Hall. For more information about the Singles Group, contact Roger Warren at 480-580-6939, or email him at rkwarren44@msn.com. The Singles Group took a tour of Chandler City Hall in January. Members of the Singles Committee: Dottie Allison, Peggy Nicholson, Don Peterson, Margot Pierce, Jim Rinehart, Betty Sandvig, and Roger Warren.